Former Lehigh Valley C-628s 640, 632, and 627, plus a Penn Central Geep lead symbol freight SR-2 (a transfer run from Conway to the Pittsburgh & Lake Erie at McKees Rocks, Pa.) departing Conway Yard under the Pinney Street overpass on September 3, 1976. The year 2018 marks the 60th anniversary of the completed facility, at one time carrying the title of “World’s Largest Push Button Yard.” With a classification capacity of 9,000 cars per day across separate eastbound and westbound classification yards, this strategically located facility stretched nearly four miles along the Ohio River near Pittsburgh. This anniversary also brought back some wonderful memories of a trip to Conway several decades ago to photograph the vast Alco fleet assigned to this yard. It also prompted some research in locating Allan Fisher, now retired from the railroad, to recall a few insightful recollections from his tenure at Conway. A lone Geep shares tracks with former Penn Central, Reading, and Lehigh Valley Alcos around the turntable. Just five months into Conrail, many locomotives have yet to be renumbered. Reading C-424 5203 would become Conrail 2492, LV C-628 637 (ex-Monon 404) became Conrail 6733, while CR C-636 6781 was PC 6331. 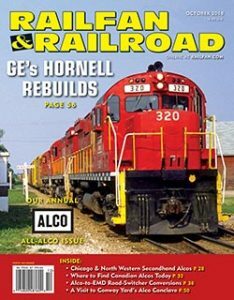 The year 1976 was a pivotal point for Northeast railroading, with the formation of Conrail. The new railroad would assign most of its inherited Alco Century power to Conway Yard, which becme the units’ home base for maintenance. This was a practice started earlier under Penn Central in 1972, when former New York Central C-430s and Pennsylvania C-628s and C-630s, along with the massive Penn Central C-636s, were taken out of general freight service to handle regular assignments in mineral service between Mingo Junction and Cleveland. Additionally, under Conrail, the Conway Yard engine terminal routinely hosted Lehigh Valley C-628s, Reading C-630s, New Haven C-425s, Reading C-424s, one Penn Central C-424, and the remainder of the Penn Central C-425s. It was this assembly of Alco power that prompted a long-overdue trip to this impressive citadel at Conway while on a summer break from college in 1976.